All of our readers are winners, but someone will win a weekly Gourmet Giveaway prize. 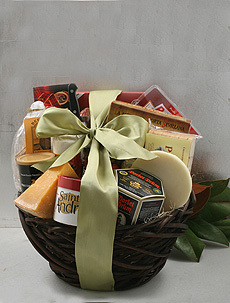 The gift basket shown above is not a current prize, but is available at iGourmet.com. Every week THE NIBBLE gives away a delicious food prize donated by one of our sponsors. Check this page each week for the prize and how to enter. The Gourmet Giveaway will become active at 12 p.m. Eastern Time each Monday and will remain active until the successive week’s Gourmet Giveaway is posted here. Prizes can be shipped to U.S. addresses only; winners must be 18 years of age or older. See detailed contest rules. Gourmet Giveaway will relaunch soon. Thanks for your interest. Watch for our blog posts and Tweets @TheNibble announcing the new Gourmet Giveaway.